In a period of ten weeks after the stock market crash on October 24, 1929, stocks on the New York Stock Exchange lost half of their value. As stock prices continued to fall during the early 1930s, banks closed, businesses failed, and unemployment rose sharply, doubling from four million in 1930 to eight million in 1931. By 1932, there were 12 million without jobs--one of every four workers. President Herbert Hoover had taken some steps in an attempt to soften the impact of the economic depression, primarily by increasing federal construction of public works projects and urging state and local governments also to expand their own building programs. The Administration also encouraged voluntary efforts by employers to spread available jobs to more people through shortened workweeks and workdays. Hoover resisted, however, additional spending to create jobs or provide relief for the unemployed which would produce a federal budget deficit, maintaining his belief that the economy would start to improve without the need of major intervention by the government. The President's restraint inevitably led to personal attacks linking him with the cause of distress, such as the so-called "Hoovervilles," the shanty towns set up throughout the country where those who had lost their homes through foreclosure lived in makeshift shelters. In 1931, Hoover vetoed a bill providing bonuses for World War I veterans, rejecting the contention that the bill would help stimulate spending and strengthen the economy. 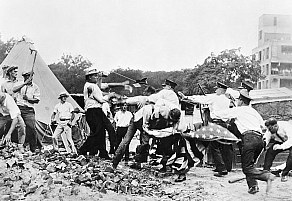 In 1932, thousands of veterans traveled to Washington as the "Bonus Expeditionary Force" or "Bonus Army" to lobby unsuccessfully for Congressional passage of a new bonus bill; even after the bill was defeated in the Senate on June 17, they stayed for weeks longer in makeshift tent camps until troops under the command of General Douglas MacArthur were called out on July 28 to clear the streets. 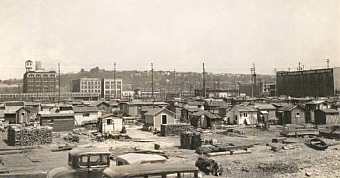 MacArthur apparently ignored orders from Hoover not to pursue the protestors to their main camp across the river from downtown Washington, which was destroyed by a fire of uncertain origin, but MacArthur's praise of Hoover for his action placed responsibility on the President for the unpopular move just as his 1932 re-election campaign began. ....We can not further the restoration of prosperity by borrowing from some of our people, pledging the credit of all of the people, to loan to some of our people who are not in need of the money. If the exercise of these rights were limited to expenditure upon necessities only, there would be no stimulation to business. The theory of stimulation is based upon the anticipation of wasteful expenditure. It can be of no assistance in the return of real prosperity. If this argument of proponents is correct, we should make Government loans to the whole people. . .
At the Democratic National Convention in Chicago, on the first two ballots Roosevelt fell short of securing the two-thirds majority needed for the nomination in marathon voting sessions that ran through the night past dawn of the following day. On the third ballot, however, House Speaker John Nance Garner, who was in third place behind Roosevelt and Smith, decided to withdraw as part of a deal for his nomination for vice president, freeing enough delegates to give Roosevelt the presidential nomination. Once nominated, Roosevelt broke precedent by appearing personally to accept the nomination and address the delegates, promising that he would offer a "New Deal" (adapted from his cousin Theodore Roosevelt's "square deal"). Roosevelt's campaign also departed from tradition in communicating its message by making the candidate freely accessible to the press, even adding a special press car to its campaign train. The campaign also was the first to make extensive use of radio broadcasts, exploiting Roosevelt's reassuring voice and confident delivery that would later be effectively used during his Administration. The positive relationships with the media cultivated by Roosevelt also may have contributed to the unspoken policy in which journalists avoided references to or publishing photographs of his paralysis from the effects of polio he had contracted in 1921 at the age of 39. Roosevelt defeated Hoover by seven million votes, taking over 57% of the popular vote and receiving 472 votes to 59 votes for Hoover in the Electoral College. 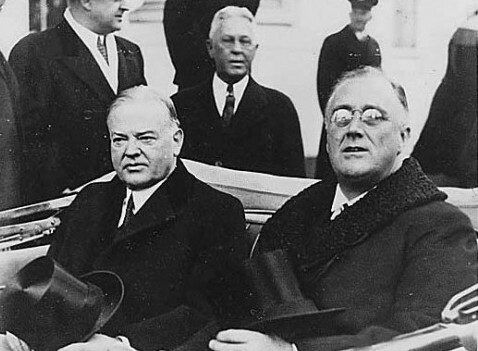 After Roosevelt's overwhelming election, a rather contentious relationship developed between the president-elect and the outgoing Hoover administration. Despite the repudiation by the voters, Hoover continued to follow his cautious fiscal policy in the months of the protracted transition period from November to March until the new president was inaugurated. The delay in the transfer of power also led to calls for a shorter transition, which would ultimately lead to the approval of the 20th Amendment to the Constitution changing the inaugural date to January 20 following the presidential election. ﻿The rapid pace of proposals offered during the first "hundred days" of the Roosevelt Administration set an informal benchmark for measuring the records of subsequent new presidents. The program included massive building projects, such as dams and hydroelectric power developed through the establishment of the Tennessee Valley Authority, and extensive regulation of business and labor by such new agencies as the National Recovery Administration (NRA) established under the National Industrial Recovery Act of 1933. A key component of the programs were codes that business and labor were directed to adopt on how specific industries would manage prices and wage levels that would be submitted to the NRA for approval. By 1935, some measure of recovery was apparent, but opposition continued to the New Deal's extraordinary intervention in the economy and the surging federal deficits. In May, 1935, in the case of Schecter Poultry Corp. v. United States the U.S. Supreme Court invalidated the compulsory-code system as it regulated the poultry industry on the grounds that the legislation establishing the NRA was an unconstitutional delegation of legislative powers to the executive and that the provisions of the poultry code did not constitute a regulation of interstate commerce. Subsequent decisions by the Court also held that other components of the New Deal were unconstitutional.